The moment came this week. There is something about a week of no responsibilities to cue my body– it’s time to bring on the sneezing, coughing, and aches. It seems to happen every year. Walking around Disney World with a bag full of tissues hoarsely singing “It’s A Small World” is not what I’d call ideal. This year I decided to go on the defensive. I’ve found eating real food with plenty of good fats, lots of veggies and fruit, homemade probiotics (such as kombucha and yogurt), and getting enough sleep really do help keep my family healthy and away from frequent sickness. It’s amazing how the body when nourished and cared for works beautifully in the healing and staying well departments. We live in a world when even the most well nourished bodies get sick. It happens. I think that’s part of being human, and well, let’s face it, there are many times I don’t get a great amount of sleep (I’m a mom and a bit of an overachiever) and maybe forget to feed myself something other than a mere apple for breakfast and lunch. As I mentioned before that long trail of wordiness (vacation brain), I went on the defensive this year. Last year (after family vacation) I learned of a miraculous little liquid called Elderberry Syrup. Have you heard of it? It’s pretty darn amazing. It’s delicious and boosts your immune system, making it ideal for the winter months when colds and the flu abound. Don’t believe me? I know, I may be starting to sound like the local Witch Doctor to some, but trust me this stuff is good. I started buying elderberry syrup at the health food store. Let me tell you, those bottles of black syrup aren’t cheap. For about 6oz. I would pay $16. Woozers! Between four people taking a tablespoon a day, I just couldn’t afford those bottles for long. Liquid gold! 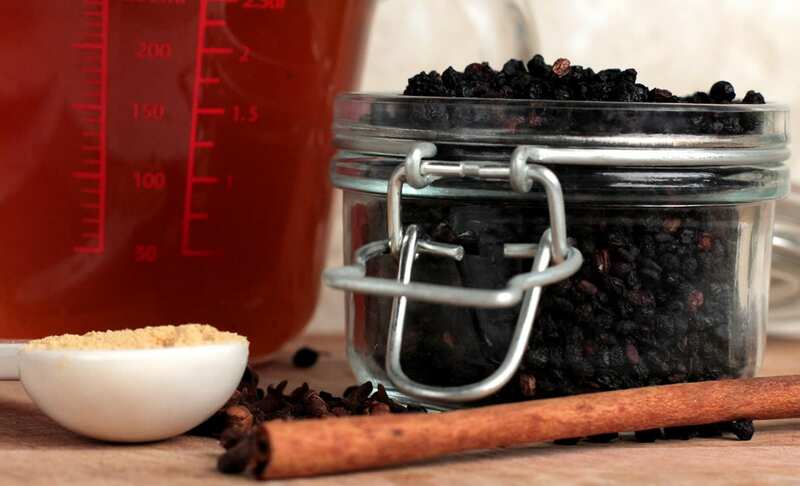 I quickly found making elderberry syrup at home was easy and cheap. 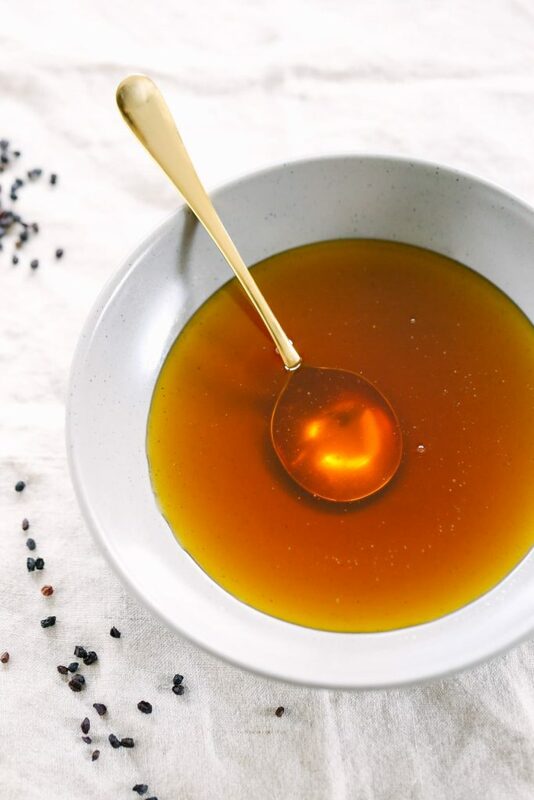 This year, while packing vacation goodies, I was sure to make a batch of this immune-boosting syrup to get the added protection I needed from any cold that may come my way. This vacation has been a sick-free relaxing week! Making the syrup only requires a few simple ingredients and can be made in 45 minutes, start to finish. The result is a syrup that’s delicious (so kiddos easily take it), immune-boosting, and can last for a couple of months when stored in the fridge. I make pint-sized batches at a time and give each of us a tablespoon daily. If a sickness strikes, I give the syrup every 4 hours with a dosage of 1 teaspoon. Now, that’s my kind of syrup. 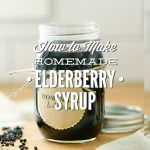 I quickly found making elderberry syrup at home was easy and cheap. Strain the berries from the juice. I use a cheesecloth and small mesh sieve over a bowl. Push the berries in the strainer down with the back of a wood spoon to remove any extra juice. Stir in the honey. The berry mixture should still be warm, not hot, just slightly warm. Now you have the perfect syrup for fighting off the sniffles this season. Keep in the fridge. Take 1 tablespoon daily by spoon or even mix it in a smoothie or with sparkling water. Hey Chris, This recipe is an older recipe before we used a recipe “card” with a printable option. The best option is to copy and paste the recipe into a Word Doc and edit, then print. Enjoy the syrup! Do you know if this syrup is safe for use during pregnancy and lactation? Thanks! Hey Bethy, I did some research on this topic and it looks like there isn’t much conclusive evidence that elderberry syrup is safe during pregnancy or breastfeeding. Some sources say it’s okay, while others say to avoid it. Hi, when you simmer for 30 minutes, lid on or off? Hey Ashley, I recommend not using a lid. Are you using dried or fresh cloves? This post came at the perfect time, I was just thinking about whipping up a batch before the holidays, thanks for the super clear instructions. I am going to try to make this! How much does this make? Thx! This recipe makes a little less than a quart. I’m always excited about how much I get and for so little money! Great! I was hoping to get that much. I will try it out, thank you! How many months does it last? I am making this now! Do you let it simmer covered or uncovered? Thanks! Thank you! I cooked it uncovered, and it still turned out great! I will cover it next time. Do you give your son a Tbsp also, or less? I give my three year old a Tablespoon a day and my one year old, half a tablespoon. So glad it came out well for you. I need to make some more. Oh dear, first you said you leave the lid off when simmering? And now you say you usually cover it? Very confusing. Never mind will check it up, I am sure to find my answer. Hey Rosina, I’ve done both–you’ll still create a good syrup :). I usually just put the lid on the pot. Why not just blend the berries and water, after is has soaked, in a blender instead of straining? If you decide to do that, I would use a hand blender (immersion blender) and then strain the extra pulp/berries. It’s worth a try. The berries after steeping are much like veggies in broth, all the good stuff has been extracted. 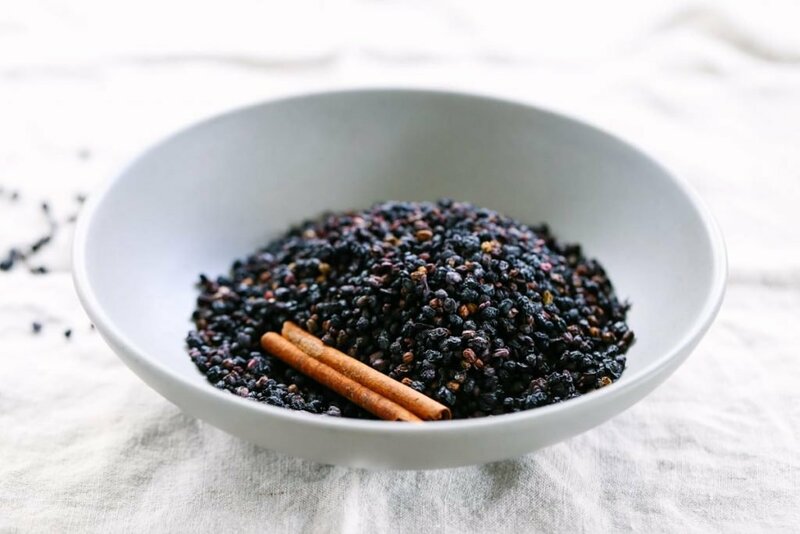 I’m going to try making this at home as soon as I can get my hands on dried elderberries. 🙂 We reposted your recipe. Thanks so much for sharing! 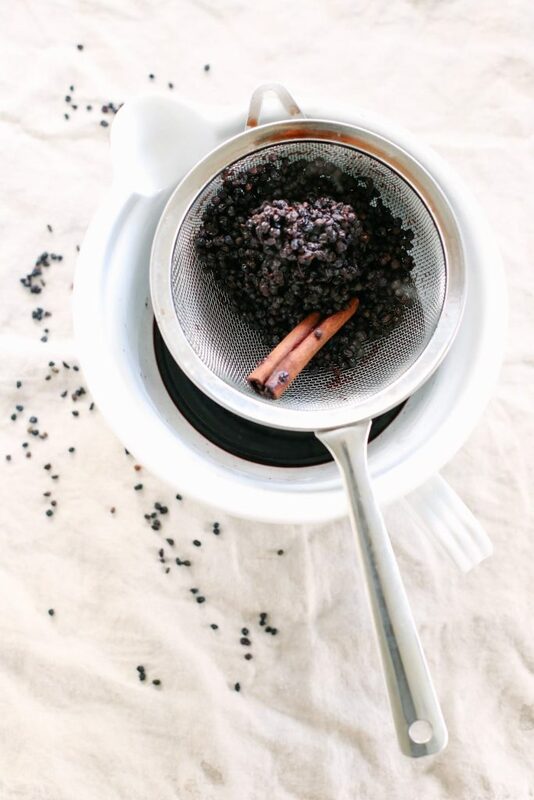 I like to make Elderberry tea when I feel a bit down and tired and needing a pick me up. I use my own dried Elderberries, I put some Sage, a Clove, some Ginger and even some Raspberry leaves in it, put it in my favorite tea pot and let it steep after it boils for about 5-10 minutes. We love it with some Honey in it for a bit of a sweetener. I love to pick Elderberries here on our small farm and dehydrate them to my specks and then store them in a good tight fitting jar, and use as needed. Now I will have more of a reason to pick and dry these little berries. Thanks for the recipe and I will be sure to make it soon. could you use fresh elderberries? my sister lives down the road from me and she has an elderberry tree that produces lots of berries. or would you have to dry them? Hi Ali, I’ve never had the opportunity to use fresh elderberries, so I’m not sure about using them. I have a feeling the reason most of us use dried berries is because we don’t have access to fresh. If you try the fresh berries, I’d love to hear how it goes. 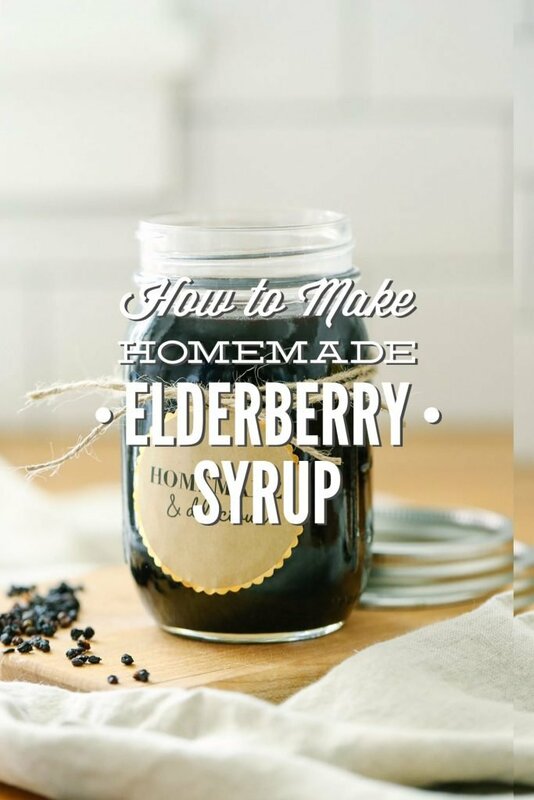 I have been wondering about making elderberry syrup gummies. Do you think it could work? Hi Lynda, Elderberry Gummies are delicious! My kids love them. I haven’t published my recipe, yet, but I believe Wellness Mama has a great recipe. Hey Donna, The syrup will last at least a month when stored in the fridge. Doesn’t boiling the berries reduce the nutrients or no? Hey Beverly, The berries are only brought to a boil and then simmered over low heat. This process extracts the benefits from the elderberries without ruining any beneficial properties. Could I use ground elderberry? I guess I would use less if it’s ground? Hey Louise, I don’t have any experience with ground elderberries, but I believe they will work in this recipe. I think you’re right, just reduce the amount compared to the whole berries. Do you have to use the honey? We are staying away from sugar and would use stevia if its for the sweetener only. I know honey has it’s own benefits. Hey Lisa, Honey does add value to the syrup, plus it helps make it more of a syrup vs. a watery liquid. While honey is a “sugar”, it’s a natural sugar that also has healing benefits and is not processed like the sugars commonly consumed (which lack any value.) You could add stevia, if desired. I showed this to a friend and she was concerned the syrup may need a stabilizer as the nutrients would quickly be lost? Any thoughts on this? I’m really excited to make it. My elderberries just came today. Hi Carrie, It’s generally recommended that homemade elderberry syrup be used within a couple of months for freshness. So as long as you’re not keeping it long-term you won’t need to worry about nutrients being lost. If you’re not sure the syrup will be used within that time frame, you can also freeze some of the syrup to help preserve it for long-term use. i can’t wait to make a batch! I’m wondering where you but your ingredirnts from? I’m torn between cinnamon sticks (cinnamonum sp) and (cinnamonum verum)….what do you use?! Hey Karice, I love Frontier brand. They are a family-owned and operated company and sell amazing spices!! I usually purchase my cinnamon sticks from the health food store, Frontier directly, or Frontier on Amazon. Here’s Frontier’s site: http://www.frontiercoop.com/products.php?cn=Cinnamon+Sticks. For elderberries, I usually either purchase berries from Amazon (linked above) or through Mountain Rose Herb. I am making my first batch today. Sooooo excited!!! I am going to add some Thieves essential oil for an extra immune booster. Was wondering if you had ever substituted Ginger, Clove & Cinnamon essential oils instead of the spices? Thank you!! Hey Amanda, I haven’t tried using oils in place of the spices. Can’t wait to hear about your syrup! Those sound wonderful, Angela! I’m going to try elderberry balsamic vinegar and a hot toddy. Thank you for sharing. Hey Amanda, You can leave both out. They mainly add flavor to the syrup. For the cinnamon stick, you could add 1/4-1/2 tsp ground cinnamon. You’re welcome. Happy syrup-making :)! So, so glad you shared this. I wish I could find a way to make it slightly thicker – it seems more like elderberry juice than syrup – but I love it anyway. I just finished making my 3rd batch of it. After my first batch I have left out the ginger because it is a taste I simply can’t stand, unfortunately. I have been taking this preventively since the start of flu season (I work in a doctor’s office!) and so far so good! I shared some with some coworkers and they came up with some neat ideas – one likes a tbsp in some sprite zero over ice (I tried it since I was intrigued by the idea, it’s like a fun immune boosting Shirley Temple or something!) and another loved it in hot tea. I applaud them for getting creative since I usually just take a spoon-full neat! Thank you for sharing all your great ideas! Laura, That’s awesome that you shared it with your co-workers and they came up with such creative ideas. The homemade version is much thicker than the store-bought version (which is very, very thick), but I think you might be able to whisk in a small amount (1 tsp or more) of arrowroot or organic corn starch to thicken it during the cooking process? I’ve never tried it, but that’s what I’m thinking. Oh, I’m just SUCH a dummy. I was using local honey for this, but it wasn’t raw honey. Now that I actually got my hands on some raw honey, I totally get how this will be thick if I use it 😉 How embarrassing! Now I know, though, and I’m excited to try it the right way with my next batch!! ps, don’t think I’m crazy, but I put a tbsp into a serving of homemade yogurt and that was pretty darn yummy too! Laura, I’m so glad you found some raw honey, and I love the idea of putting elderberry syrup in yogurt!! I’m going to try that tomorrow morning with a little homemade granola. Hey Michelle, Yes, you can :). Enjoy!!! Hey Angie, I haven’t ever tried blending elderberries, but I don’t see why not. I would probably strain the mixture through a nut bag or cheese cloth after blending, just to make sure there isn’t any “pulp” that settles. Hey Lee, Thank you :). This bottle came from the dollar section at Target. Thanks for your website and info. I am not sure if you have researched/know about this, but we take multi-vitamins and I was wondering if this is overkill to add to that during the winter months, or if you recommend in place of? Hey Laura, You’re welcome :). My kids take a multi-vitamin in the winter. From what I’ve read, elderberry syrup is usually considered safe when taken with a vitamin supplement. I’m sure all supplements are different so you may want to contact the company for more advice. I finally got my cinnamon sticks tonight and made my first batch! We did find it to be very, very honey sweet, so I actually added more water to the already simmered berries, and gave them a second simmer. I don’t know if I cooked out all the nutrients, but it was another low simmer, the juice looked just as richly dark, and it helped bring down the overly sweet (for us). It is quiet “herby” tasting, so I’m guessing that the higher honey purpose is to help mask it more. The kids didn’t care for either the highly honey version, or the slightly less honey version, but preferred the store bought :(. I noticed the store’s version had raspberry natural flavor, so I may try to add some raspberry concentrate? We’ll see. That or just mix it in our kefir smoothies and they will be none the wiser :)! Thanks again, Kristin. And thank you for the vitamin info! i will be making this today. instead of mashing and then straining the berries cant i just blend all of it in blender so wont be throwing away the good stuff 😉 what you think? Hey Vera, I haven’t tried blending the cooked berries, but a couple of readers have mentioned trying this method with success. I would still strain the mixture, after blending, to make sure the mixture is smooth and drinkable. I’m suppose to take multivitamins daily to boost my immune system but I prefer making my own. Can I use this syrup as my daily multivitamin? If not,do you have a recipe I can use? Hey Jabsa, If you need to take a daily multivitamin I would continue to take one. This syrup is just an added immune-boost :). I am going to make this but I am not sure if it will be okay if I don’t use raw honey? Is it a no go? Hey Maryam, You can use pasteurized honey in this recipe. Raw honey just contains added health benefits. Enjoy! thank you so much , have just made a batch last night ! we usually go through a 200ml shop brought elderberry syrup every two weeks in winter ($45 each !) this works out to be approx $17 for the same amount . That being said the store brought bottle also had ecinasha and olive leaf so that would add to the cost . You’re welcome, Lisa! I’m so glad the homemade version is so cost effective. Enjoy!! I just made a batch and my kids (4 & 5) really likes it, and so do I! 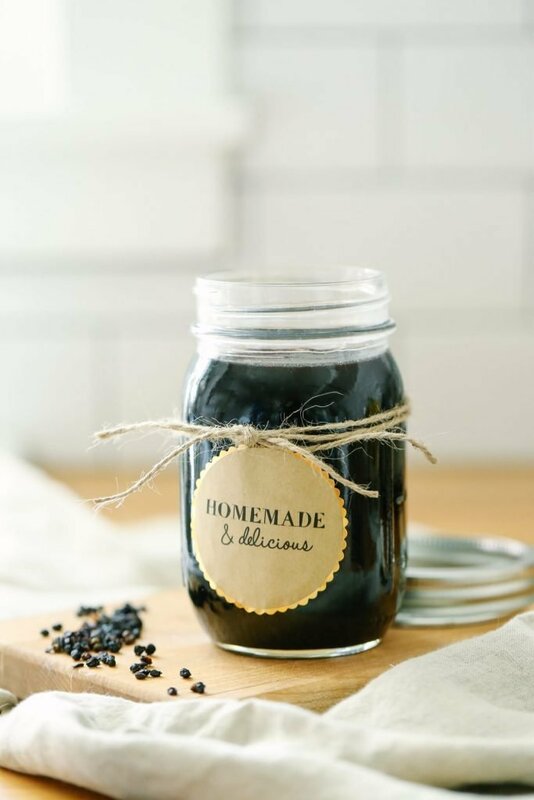 Thank you for this yummy, inexpensive recipe because I used to buy elderberry syrup on vitacost, and it became too expensive. I can’t recall how I stumbled across your blog while searching Google, but I’ve been perusing your blog ever since, and God knows I am so thankful and appreciative. Hey Candace, That’s awesome! I’m so glad you found the recipe (and Live Simply). I love when homemade solutions taste great and save money :). Enjoy the syrup! Hey Maryanne, I keep my elderberry syrup for two months in the fridge without any issue :). I was wondering…if I buy 1 lb. 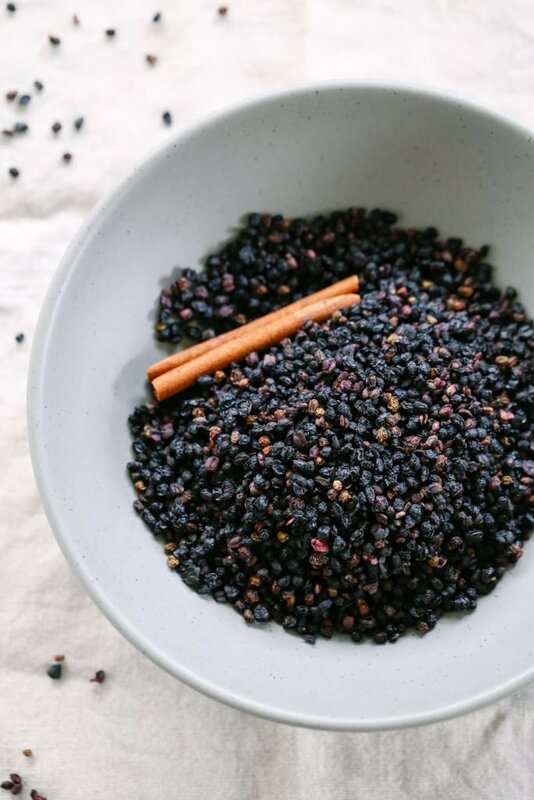 of dried elderberries, as per your link, and use 3/4 cup per batch, how many batches would that pound make? Hey Shell, I’ve never accurately measured the pound bag since I just dump the bag into a large mason jar and keep it in my pantry. From reading on Frontier’s website it appears a 1 pound bag equals 4 cups of elderberries. So with a 1 pound bag you’d be able to make several batches of elderberry syrup. I am making this today and just wanted to thank you for posting the recipe. A month or so ago I bought a bottle at the health food store and about had a heart attack when I saw that it was $15.00! Since I have a compromised immune system I need this. I am thrilled to know I can make it myself. I’ve already ordered the Elderberrys. Thanks so much! Hey Denise, I’m so glad the recipe is helpful :). It’s definitely cheaper to make your own syrup at home, and I think the homemade version tastes much better! Just wondering do you give this syrup for your child from refrigerator? It is kind of cold. How to give a child this syrup, not cold? Any advice? Hey Johanna, Yes, I do. You could warm the syrup before serving it, or let it rest at room temperature until it’s no longer cold. Yay, Johanna! I’m so glad your daughter is enjoying the syrup. I hope she feels betters soon! Hey Kim, They definitely have a distinct smell, but they shouldn’t smell “off” or repulsive. Which brand of elderberries did you purchase? It was the Frontier brand. I’m a little scared now to use it, but I will definitely taste it before I decide whether to keep it or toss. Frontier brand should be good (that’s what I use, too). They have great products and customer service, so if they are bad, you could call them and I bet they would send you a new package. I’m thinking maybe the smell is just a bit different versus rancid berries, but definitely taste a small amount after adding the honey. I’m just curious as to where you buy your clip-top jars that I see pictured in several DIY recipes? Thank you! Hey Julia, The jars are called Weck Jars. They are by far my favorite storage jars. They are difficult to find in the US (mainly a European canning jar). Both Crate and Barrel and Amazon sell them: http://amzn.to/1TOudxw and http://www.crateandbarrel.com/search?query=weck%20jars. Ok. Just made this and it’s more like flavored water than a syrup. My honey says it’s raw, but now I’m not so sure? I thought for sure my “syrup” would be thicker after adding it, but it’s not. Should I have let it cool to room temp before adding the honey? I added it immediately after straining the berry mixture. Thanks for your help! Hey Mary, It sounds like you did everything right. This is much more watery than the elderberry syrup from the store. The honey may settle a bit, so you’ll want to shake or stir the jar once a week. Could I substitute the 4 cloves for grounded clove? I don’t have whole cloves. Thanks so much! Hey Jeanne, I believe so. I would use 1/4 teaspoon. Can your recipe be canned for a longer shelf life? I have only recently discovered elderberry syrup and mentioned it to my mother. They bought elderberry CONCENTRATE from a wine company (no alcohol in the concentrate). My questions: Do you know whether you receive the same health benefits from the concentrate that the syrup gives and can you make syrup from the concentrate? I could very likely use your recipe if I knew how much liquid you have after cooking/straining the elderberries. Thanks for this recipe!!! Hi Celeste, Dried cloves :). What kind of pot would you recommend? Metal or a cast iron pot? Does metal do anything to the ingredients? Hey Mallory, Stainless or enamel cast iron are my go-to pots. I don’t think it matters :). I’m excited to try this recipe. I started buying pre-made syrup from the store but man is it $$$. I’m wondering about using fresh ginger instead of ground. I have a large root in my fridge for smoothies and am looking for more ways to use it. Would you recommend fresh and if so how much? Hey Mandy, I think fresh ginger would be lovely. I would try a 1 inch slice. Enjoy! So I’m making lots of batches of this for friends and family… I did 24 cups of water…. so do I still do the same portions? Like do 3/4 cups 8 times and 8 cups honey etc? That seems like a ton of berries? Hey Samantha, I want to say yes, but I’ve never tried making that much before. It should be noted that using freshly collected berries may be dangerous. While mature berries are safe for consumption, the fresh leaves, flowers, bark, young buds, and roots contain a glucoside that, under certain conditions, can produce hydrocyanic acid and may result in cyanide poisoning. Symptoms may include nausea, vomiting, abdominal pain, weakness, or dizziness. Kristin, you’re wise to use dried berries from a reputable company; that is the safest option! Thank you for sharing, Jenn! I appreciate your wisdom. we have enjoyed fresh picked elderberries for years, they make a good jam, pie, shortbread type cookie, wine. The stems, leaves, wood are poisonous. its a chore to pick out all the teeny tiny stems but you can see by the comments well worth the effort !! What is the price break down compared to the ones you can buy at the store? Hey Megan, I’m not sure. That will depend on the sources for the ingredients. My guess is that a bottle of homemade syrup will cost a few dollars to make–maybe $5?–using the amount of ingredients in this recipe. Compared to the store-bought which is $20+ for a tiny bottle.